Died: February 17, 1991, Operation Desert Storm. 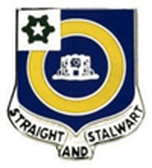 Unit: 1st Battalion, 41st Infantry Regiment. 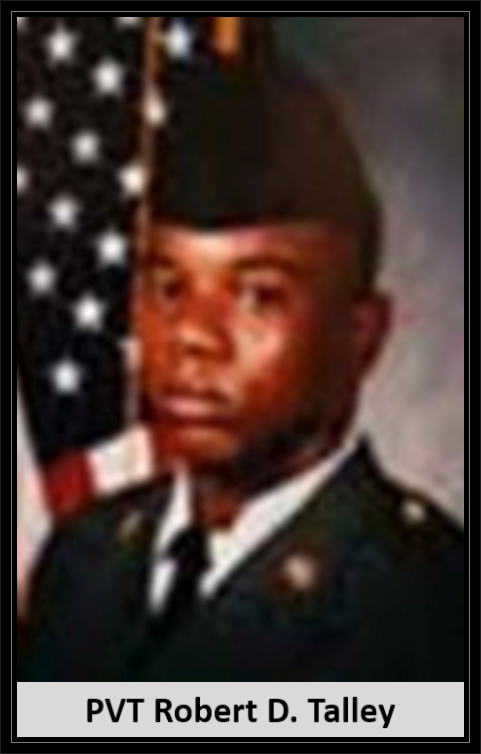 Incident: Died of injuries suffered when his Bradley fighting vehicle came under friendly fire from allied aircraft..
PVT Robert Talley and SGT Jeffery Middleton were killed by friendly fire from an Apache helicopter on February 17, 1991 prior to the start of the ground war during Operation Desert Storm. 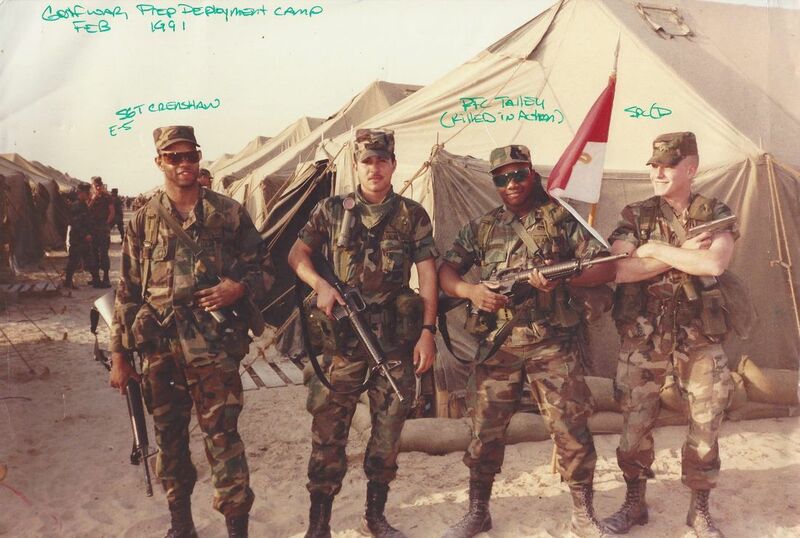 PVT Talley and SGT Middleton were among 35 friendly fire casuaties during the Persian Gulf War. The Robert Talley Scholarship was created in 1993 by Dr. Stanley S Bergen, the University of Medicine and Dentistry of New Jersey's (UMDNJ) first president, and his wife, Susan, together with Mary Mathis-Ford of the Board of Concerned Citizens (BCC) to honor the memory of Robert Talley. A Newark resident and Barringer High School graduate, Talley entered the United States Army before pursuing his goal of becoming a doctor. He was shipped to the front lines during Operation Desert Storm where he was killed in action, the first and youngest casualty of this conflict. Talley scholarships are given to students from New Jersey who aspire to careers in the healthcare professions and need financial aid. More than 35 students have received scholarships. In some ways, Lou Ann Monroe says, the days have been a blur since the morning of Feb. 18, when a solemn Army sergeant rang the doorbell at her house on Triton Place. Her 18-year-old grandson, Pvt. Robert Talley, had been killed at the front in Saudi Arabia. "It's like somebody stabbed us in the heart," she said. The Army said Private Talley was one of two soldiers killed and six wounded when the commander of a battalion of Apache helicopters mistakenly fired into two American armored vehicles during a skirmish between American and Iraqi border patrols in Saudi Arabia. The officer was later removed from his job. Private Talley's death by "friendly fire" has angered his family, who are seeking what Mrs. Monroe called a "clearer explanation" from the Government of the circumstances of his death. The Talley family's roots go deep here. Robert Talley was born and raised in the family's house, and grew up, Mrs. Monroe, said, in an environment "where we all raised our own and everybody else's kids." Within hours of the Army sergeant's brief, sympathetic visit seven days ago, the Talley-Monroe family began gathering for their sad reunion. Neighbors on the street on a cul-de-sac between Broadway and McCarter Highway in the North Ward, where American flags and yellow ribbons are ubiquitous, "have been available around the clock," Mrs. Monroe said. Mayor Sharpe James, City Council members and members of churches from throughout the city have made pilgrimages to the brown house with red trim. This afternoon the family continued to attend to the burial details. As Mrs. Monroe sat talking with a visitor, her daughter, Deborah L. Talley, Robert Talley's mother, met in another room with the family's lawyer, preparing for her son's wake tonight. Mrs. Monroe and her husband, James, share the three-story house with Mrs. Talley and Robert's two brothers, William, 16, and Ronnie, 12. 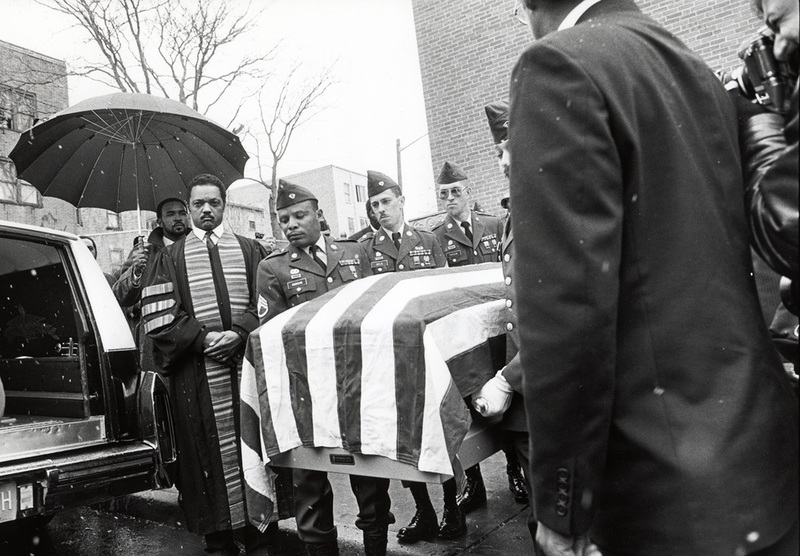 They talked of Robert Talley, whose service in the Army was to be the route to becoming a doctor. That had long been his dream. Athletic and packing a solid 184 pounds on a 5-foot-7-inch frame, Private Talley had forgone sports at Barringer High School in Newark to concentrate on his studies and the school's Reserve Officer Training Corps program, which he joined in his junior year. He planned to serve his country, and then use his benefits to attend college and medical school, the family said. He graduated from Barringer in June, entered the Army on Aug. 7, left for three weeks of training in Germany in early December and arrived in the Persian Gulf just after New Year's. He was sent to the battlefront, with the First Infantry Division, in mid-February. "He had only been there seven days," said Mrs. Monroe, 68. "He called Feb. 9 to tell us goodbye." "They're sending me to the battlefront," she said he told her. "I said, 'Never say goodbye. Never say goodbye. Say so long,' " Mrs. Monroe said, her voice rising, then falling. "But it was goodbye. We never heard from him again." In letters written in January, but which the family received after his death, he said that he was worried about being at the front, but that he had a job to do and was going to do his best. "He wrote he had seen more in the past six weeks than most people see in a lifetime," Mrs. Monroe said. "He said it only strengthened his determination to become doctor, to help ease other people's suffering." Mrs. Monroe said her grandson was "a trusting, thoughtful young man; determined, dedicated and lovable in every respect." That is probably what prompted two of his classmates, representing the Barringer High School Class of 1990, to write a long memorial poem to him, which read, in part: He served our country like he Wanted to do, to defend the great honor Of the Red, White and Blue. A friend of us all, he was one of the Best. Taken by the Lord, may his soul now rest.